Federal Reserve Chair Janet Yellen waits for a hearing of the Joint Economic Committee in Washington, D.C., on Nov. 29, 2017. Janet Yellen chaired her final Federal Reserve policymaking meeting Wednesday. She and her Fed colleagues held interest rates steady and officially elected Jerome Powell to succeed her as chair. As Yellen steps down, she is getting high marks for her four years at the helm of the nation's central bank. The Fed's mandate from Congress is to maximize employment while keeping inflation under control. When Yellen became chair early in 2014, the first woman ever to do so, the unemployment rate was 6.7 percent. Now, at the end of her term, it's 4.1 percent and inflation is low and stable. That's a stellar achievement, says former Fed Vice Chair Alan Blinder. "If you asked anybody, including [former Fed Chairman] Ben Bernanke, four years ago, whether we could achieve that without rising inflation almost anybody would have said no. So this is a gigantic success," Blinder says. And economist Julia Coronado, president of MacroPolicy Perspectives, says it's important to remember it could have been different. Inflation was well over the Fed's 2 percent target in 2011, when Yellen was serving as the Fed's vice chair, Coronado notes. With inflation rising, the historical Fed playbook would have dictated raising interest rates swiftly to crush it. "But the unemployment rate was still very high," says Coronado, "and Yellen encouraged the Fed not to overreact to ... what turned out to be a blip in inflation." Raising interest quickly could have slowed the jobs recovery and hurt millions of workers, whose plight Yellen highlighted in her first speech shortly after becoming Fed chair in early 2014. "The recovery still feels like a recession to many Americans," Yellen told an audience in a conference sponsored by the Federal Reserve Bank of Chicago. "The numbers of people who've been trying to find work for more than six months or more than a year are much higher today than they ever were since records began decades ago." It would be nearly two years into Yellen's term before the Fed lifted interest rates from near zero, where they had been since the Great Recession. But Yellen's determination to keep rates extremely low produced criticism, especially from Republicans, including Sen. Pat Toomey of Pennsylvania. Toomey challenged Yellen's strategy during a Senate Banking Committee hearing in February 2015. "The financial and economic crisis is over," Toomey said. "It's been over for years; at least six or seven years, and yet we still maintain crisis-level interest rates." He said the Fed was risking an outbreak of inflation and financial instability by keeping rates low. But inflation didn't accelerate — in fact, it remains below the Fed's target. Glenn Hubbard, who headed the Council of Economic Advisers under President George W. Bush, also criticized Yellen for keeping interest rates extremely low. Hubbard thinks low rates may be fueling dangerous bubbles. And he says Fed bank regulation was sometimes counterproductive on Yellen's watch and may have restrained economic growth. But Hubbard, now the dean of Columbia University's business school, gives her high marks despite that. "I would give Chair Yellen an A-minus," he says. "She inherited a difficult situation and I think has done a good job." President Trump also gave Yellen high marks, but he declined to give her a second term. Blinder, now a professor at Princeton, says she should have gotten one. "She was fabulously successful and wanted a second four years," Blinder says, "and yet was not given another four years." That's unusual. Going back to Ronald Reagan, every president has crossed party lines to reappoint Fed chairs. Coronado says it's disappointing, partly because Yellen is the first woman to lead the Fed. "It was inspirational when she got named Fed chair. You know, mentors matter," Coronado says. Yellen's last day at the Fed is Saturday. She'll be replaced by Fed governor and former investment manager Jerome Powell. He will be sworn in on Monday. It's expected Powell will continue Yellen's gradual approach to raising rates. But that could be challenging if the U.S. economy keeps picking up steam. 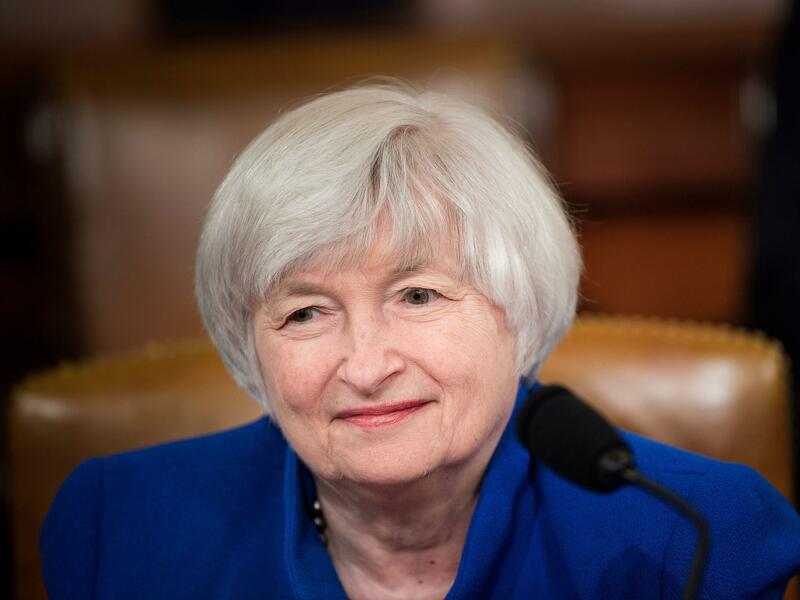 Janet Yellen presided over her final Federal Reserve monetary policy meeting today. Yellen and her Fed colleagues held interest rates steady and officially elected Jerome Powell to succeed her as chairman. As NPR's John Ydstie reports, Yellen is getting high marks for her four years at the helm of the nation's central bank. JOHN YDSTIE, BYLINE: The Fed's mandate from Congress is to maximize employment while keeping inflation under control. When Yellen became chair early in 2014 - the first woman ever to do so - the unemployment rate was 6.7 percent. As she leaves, it's 4.1 percent, and inflation remains very low. That's a stellar achievement, says former Fed Vice Chair Alan Blinder. ALAN BLINDER: If you asked anybody, including Ben Bernanke, four years ago whether we could achieve that without rising inflation, almost anybody would have said no. So this is a gigantic success. YDSTIE: And economist Julia Coronado says it's important to remember it could have been very different. Coronado, who is president of MacroPolicy Perspectives, points out that inflation was well over the Fed's 2 percent target in 2011 when Yellen was serving as the Fed's vice chair. With inflation rising, she says the historical Fed playbook would have dictated raising interest rates rapidly to crush it. JULIA CORONADO: But the unemployment rate was still very high, and Yellen encouraged the Fed not to overreact to that - what turned out to be a blip in inflation. YDSTIE: And raising interest rates could have slowed the jobs recovery and hurt millions of workers. Yellen highlighted the plight of the unemployed during a speech in Chicago shortly after becoming Fed chair. JANET YELLEN: The recovery still feels like a recession to many Americans. The numbers of people who've been trying to find work for more than six months or more than a year are much higher today than they ever were since records began decades ago. YDSTIE: It would be nearly two years into Yellen's term before the Fed lifted interest rates from near zero where they'd been since the Great Recession. But Yellen's determination to keep rates extremely low produced criticism, especially from Republicans, including Pennsylvania's Pat Toomey, who confronted Yellen at a Senate Banking Committee hearing. PAT TOOMEY: The financial and economic crisis is over. It's been over for years - at least six or seven years - and yet we still maintain crisis-level interest rates. YDSTIE: Toomey said the Fed was risking an outbreak of rapid inflation. Of course, inflation didn't accelerate. In fact, it remains below the Fed's target. Glenn Hubbard, who headed the Council of Economic Advisers for George W. Bush, also criticized Yellen for keeping interest rates extremely low. He still thinks that may be fueling dangerous asset bubbles. Hubbard also says Federal Reserve bank regulation was sometimes counterproductive on Yellen's watch and may have restrained economic growth. But Hubbard, who's now dean of Columbia University's business school, gives Yellen high marks anyway. GLENN HUBBARD: I would give Chair Yellen an A-minus. She inherited a difficult situation and I think has done a good job. YDSTIE: President Trump has also given Yellen high marks, but he declined to give her a second term. Alan Blinder, now a professor at Princeton, says she should have gotten one. BLINDER: She was fabulously successful and wanted a second four years and yet was not given another four years. YDSTIE: And that's unusual. Going back to Ronald Reagan, every president has crossed party lines to reappoint Fed chairs. Julia Coronado says it's disappointing partly because Yellen is the first woman to lead the Fed. CORONADO: It was inspirational when she got named Fed chair. You know, mentors matter. YDSTIE: Yellen's last day is Saturday. She'll be replaced by Fed governor and former investment manager Jerome Powell. He will be sworn in on Monday. It's expected Powell will continue Yellen's gradual approach to raising interest rates. John Ydstie, NPR News, Washington. Transcript provided by NPR, Copyright NPR.